This delightful necklace features an alternating pattern of white faux pearls and genuine Austrian crystals strung along a silver chain. Included with the necklace are a sparkling pair of Austrian crystal earrings. 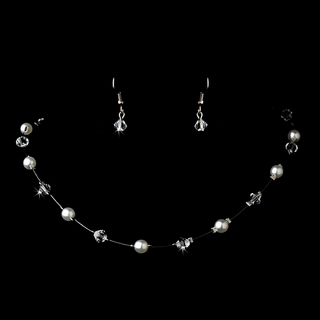 This lovely jewelry set would be the perfect addition to any elegant affair! Size: The necklace measures 14-1/2" long with a 2" extender. The earrings measure 3/4" long.